Above the ancient botanical garden, in the heart of downtown Kiev, towers a two-level penthouse with a scenic skyline view. When buying these apartments, the developer didn’t have a clear idea of who the ultimate tenants would be, but he clearly understood that this real estate investment had great potential. Bearing in mind that the 255-m2 property on the 16th and 17th floors consisted only of its external walls, he hired Geneva-based Kulyk Interior Design Studio to create the right ambiance. The initial request was to transform the existing space into a multifunctional, cosmopolitan, and sophisticated penthouse. The first challenge was the stairway opening: its critically small size, arrangement, and configuration called for an awkwardly-shaped staircase, which obviously didn’t fit in with the desired design concept. “We searched for awhile for a solution which, despite all of the existing limitations, would allow us to bring this architectural element to life within the context of the interior,” says Iuliia. 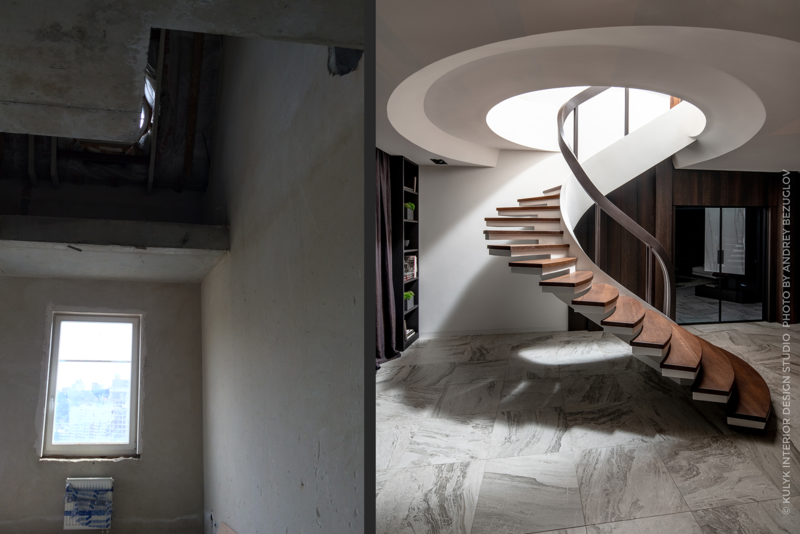 “In the end, we transformed a shortcoming into an advantage: we crafted the staircase opening and stairway into a unique shape, which became a focal point of the penthouse’s first floor. “From the very beginning, I was inspired by the neighborhood — the building is located across the street from one of the oldest botanical gardens in Ukraine,” explains Iuliia, regarding the interior’s concept. “In my opinion, a garden is the perfect place for self-observation, contemplation, and replenishing your emotional resources. My intention was fairly ambitious — to recreate the garden’s atmosphere indoors and fill it with high-quality, authentic objects and textures. For example, for this particular project, we supplied a unique wooden veneer, for bespoke furniture designed by our studio and crafted by a local manufacturer. A special feature of this veneer is the natural yet deep and dark shades of the wood, which were achieved using a smoking technique.” In general, the space’s atmosphere turned out to be airy and tranquil, and evokes the contemporary Italian style. The penthouse is clearly divided into two halves: the social areas and the living quarters, which do not intersect. On the lower level, there’s a living room, kitchen, dining room, guest bedroom, utility room, and guest bathroom, while the family bedrooms are located on the upper level. For now, only the master bedroom, together with its walk-in closet, en-suite, and separate bathroom have been finished on the upper level. The other rooms are awaiting their residents, at which point their function and use can be determined. Another challenge that arose when planning the project was creating a layout that would allow for multifunctional usage of the same space. For example, cooking up a laid-back dinner party for a crowd would require a different setup than hosting formal events. 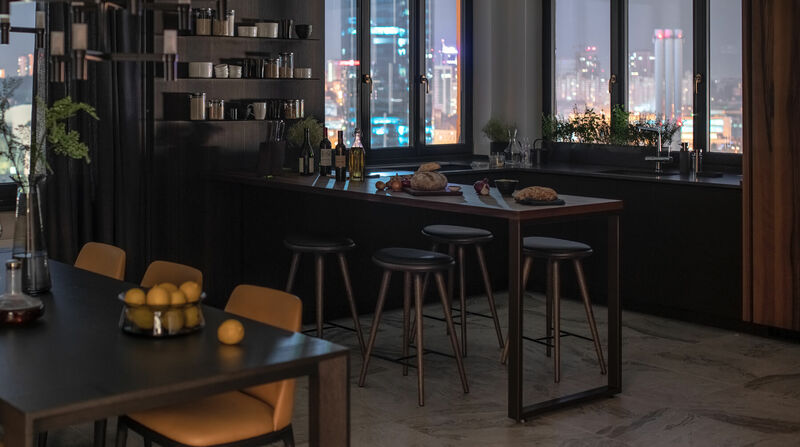 That’s precisely why combined the kitchen and dining area can be divided using a moving wall, whose sound insulation is equal to that of a regular plaster partition. Also, the room adjacent to the kitchen has two entrances, making it easy to serve guests in the dining room without obstruction when the kitchen area is detached. The dining room can also be used for business meetings, thanks to its minimalist design. Overall, the interior feels calm and harmonious, despite the rather bold choice: to make most of the walls nearly black. 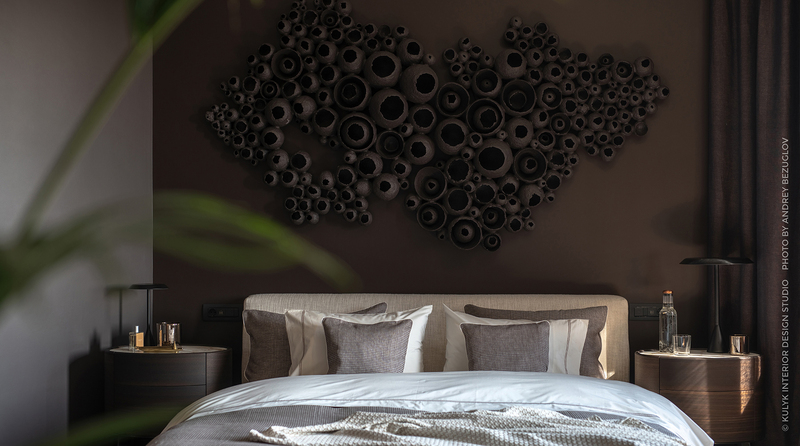 Many contrasting approaches were used, counterbalancing the neutral tones and textures: deep, cool brown with white; dark wood with pale marble; natural linen with elaborate, textured cotton. Tropical plants serve as accents, breaking up the severe geometric lines with their natural shapes and saturated colours.